Malware attacks have become very common in the recent years. Online privacy is at stake with hackers and scammers introducing new techniques to deceive users, businesses and websites day-after-day. It is the duty of the website administrators to safeguard their websites from such malware attacks and the same implies to websites hosted using WordPress platform. With the rise of cyber-vandalism, cyber espionage, hacktivism, cyber warfare and other nefarious activities, online security is a grave matter of concern for everyone. Attacks are unanticipated, in order to take strong measures to ensure the safety of the websites/web pages, running website security scans can be a solid solution to these issues. Why should the WordPress site be scanned? Hackers and scammers are constantly evolving their methods to infiltrate into the system for their personal gains. Even though WordPress is safe, it is not completely immune to such attacks. Therefore, it is recommended to do a website security scan periodically to stay convinced about your website safety. Be it WordPress.com or WordPress.org, it is advised to scan your site for viruses and other types of infections time by time. It doesn’t matter if you are a beginner or a traditional user, even blogger websites are no exception when it comes to safety and security. Remember, it is very important to run website security scan, this helps to evade numerous online problems. In order to secure your website’s privacy, you can make use of the free tools available online to perform a website security scan. The free website security scanner provides you with an extensive report on the website’s activities and performance. It’s easy to operate on the affected website. Scans your site and checks for vulnerabilities. Buy the paid version for more features and advanced scanning. The free website scanning tool is okay to perform basic checks. But buy the paid version for commercial use. The free website scanning tool informs you about the threats after performing the scan. This free website security scanner checks for malware, viruses, errors and outdated security. The vulnerability alerts help in identifying the security problems and checks places such as the plugins, themes, and files. Performs a thorough check by going through files, core, and plugins. Besides the regular checks, it also tries to find functions and codes used by hackers. It is more capable of checking for malware and viruses in the website core files and files. It notifies the website owner and administrator when they are active to aid in applying security patches to them. Uninstall unnecessary plugins without any second thoughts and retain the useful ones. Even though they are all WordPress recommended, it doesn’t mean that they are immune to malware attacks. This approach helps in safeguarding your website from malware attacks. Always use strong passwords to stay protected from malware and ransomware attacks. The strong password consists of more than eight digits, punctuation, and upper/lowercase characters. Keep updating the Plugins and Themes whenever it is necessary. Log in to the WordPress admin dashboard to update. When the WordPress web page uses captcha on its forms, it prevents the spread of malware and wards off brute-force attacks on your site. 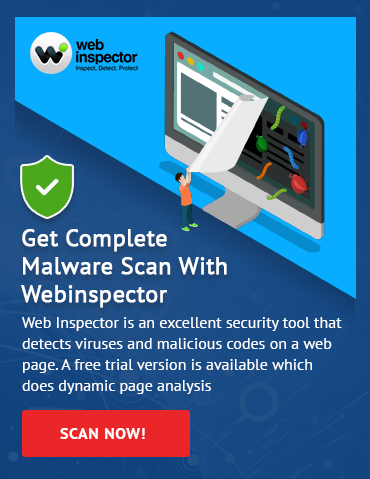 You can use Web Inspector to protect your website. It’s advanced website security scan checks for malware and prevents the spread of malware. Try Web Inspector today!